Save time and money with a fully maintained, tax-deductible Managed First Aid Kit Service. We will deliver, install and ensure 100% WHS compliance for your workplace. Buying a kit requires you to constantly re-stock it, source quality First Aid supplies and stay up-to-date with changing WHS legislation. Alsco's rental program takes all of that headache away, giving you peace-of-mind. 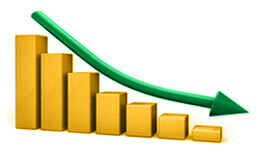 It even takes away the financial burden of capital outlay and depreciation, replacing it with a tax deductible service. We do not spam. Privacy guaranteed. 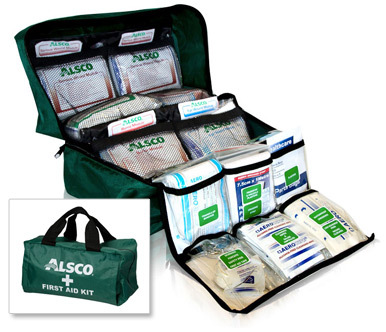 Why are Alsco's First Aid kits better than the rest? Each item in Alsco’s first aid kits are colour-coded for specific injuries, ensuring you select the correct first aid kit for your required situation. A removable door liner is exchanged each service. Well labelled, transparent packaging allows you to find the right supplies when you're in a hurry. A service card in each cabinet is used to log service dates. Each kit has a logical, standard layout that makes it simple and easy-to-use. Sometimes isn't good enough. As at 23 February 2015, 24 Australian workers have been killed while at work*. This is a death occurring every 2.5 days worked. 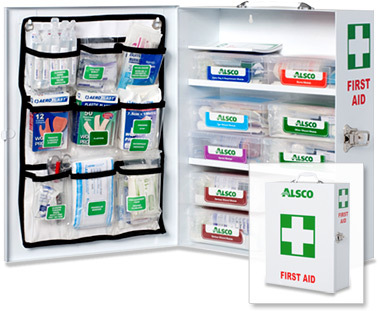 With Alsco's Managed First Aid Kit Service you can be sure that you'll have the first aid supplies you need, specific to injuries, on hand every time. 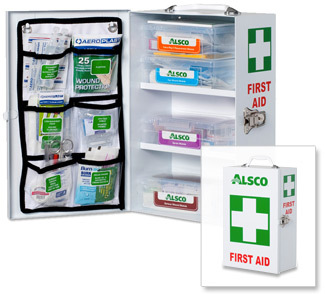 A convenient rental plan from Alsco ensures your office is always ready for an emergency with the Regular First Aid Kit. Suitable for Australian workplaces in office, retail, hospitality and industrial environments where first aid needs to be quickly attended to. Pay a regular, fixed fee and we’ll supply a fully equipped first aid kit to your workplace and keep it WHS compliant with regular refills for years. No need to think about first aid supplies again! Every new customer receives a free* motorist kit. Limited time offer so get in fast. 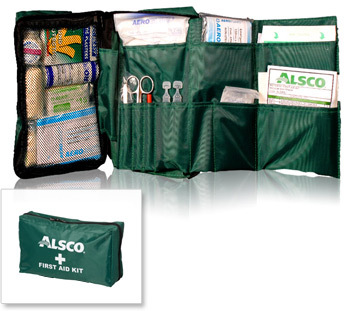 This Alsco first aid kit is specifically designed for the food and beverage industry. Supplies adhere to regulations in the food industry such as blue band aids and blue bandages. 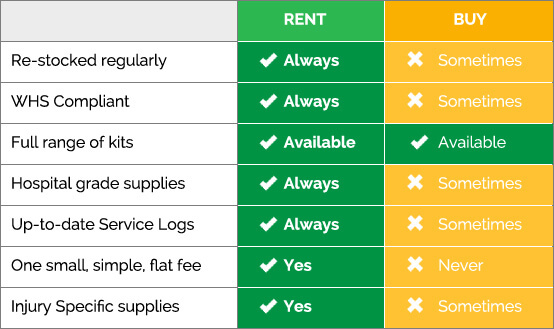 With a convenient rental service you can set-and-forget! 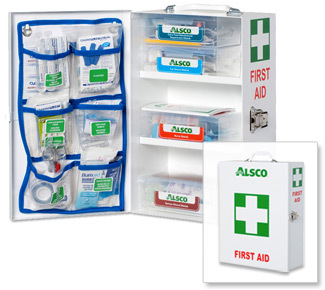 Your first aid compliance will be managed by Alsco on a regular basis and includes regular ‘free’ refills. You’ll never need to wonder whether your first aid kit is up-to-date and WHS compliant. For a limited time every new order receives a free* motorist first aid kit. Rent now to take advantage of this offer. Suitable for smaller workplaces this convenient first aid kit still comes with regular, quarterly servicing for one low yearly cost. There’s no need to buy refills as these will be supplied directly by our service team to your premises on a regular basis. Alsco deliver the kit to your premises, install and then maintain the refills and check the injury register to ensure your business is compliant with Australian WHS regulations. Alsco’s set-and-forget rental service is THE most convenient way to ensure first aid compliance for your future. Get a free* motorist kit for a limited time. Buy now to save time and money. Specifically designed for cafes, restaurants, catering, food market stall holders and businesses in food and beverage industry this compact first aid kit is in a convenient size and includes blue band aids and blue bandages. Easily mounted on the wall, in a robust, highly visible metal cabinet, you’ll ensure that your staff have fast access to first aid supplies as needed. Pay one low yearly amount to have your kit delivered, installed and regularly refilled with new first aid supplies every quarter. Buy now to get a free* motorist kit included at no additional cost. This portable kit can easily be tucked behind or under a car seat for fast, convenient access in emergencies. Ensure that your fleet of drivers have first aid supplies whenever they’re on the move. Comes in a tough, polyester bag and includes colour-coded modules so you can grab the right first aid supplies the first time. With a low yearly payment every first aid kit will be regularly serviced to ensure WHS compliance and used supplies will be replaced. A convenient service agreement gives you peace-of-mind. For those on the move, this soft sided pouch is easily tucked away in the glove compartment, under the seat or in the boot cabinet of fleet cars and trucks. Every employee, especially remote workers, need fast reliable access to first aid. Make sure your staff are covered everywhere they are. 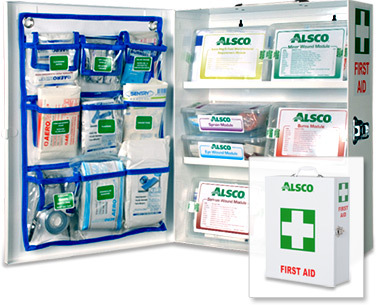 With Alsco’s rental service you’ll have peace-of-mind knowing that your staff have access to appropriate first aid supplies throughout the year. Pay one yearly fixed fee and benefit from Alsco’s no-hassle service. Act now! Make your workplace a safer environment and get WHS compliant.